Great history of my first assignment as a young Officer. Could you help me with finding Major Royals website. Would like to make contact again after all these years! Thank You! Former Captain Widger then Lt.
What about the SECOND 56th Trans Co's pocket patch, which was used AFTER this original RED patch? i have all three and i think the red one was the last one h.k. 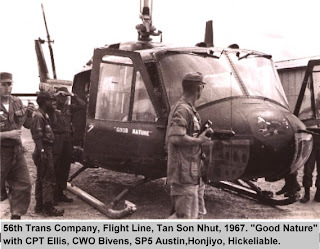 c .
Will UH-1B 62-1890 get it's original 56th Trans Co paint job back? Is that a possiblity? Don't have any info on the patch following the "red" patch, if you send a picture and some more info, we can do another post. We would welcome more pictures and stories about the aircraft and the unit. No decision has been made yet on a paint scheme. We're still working on the basics, like getting her licensed and flying again. Was traded from 339th to 56th in 1964, i was pfc Broussard,Jerry stayed with 56th sevsn months, have few pictures and was crew member on ch-37. Jerry, you still around? I also worked on the 56th CH-37's. 658, 659, and 1004. Drop me a line! I have lots of photos and other stuff including some video from old movies showing hover hookup training. My father, Robert J. Curtis (Sarge First Class on retirement) was in the 56th in Vietnam, 1964-1965. SP5 David Robin (at the time. )From Apr 1965 to Apr 1966, I crewed Good Nature 3 which was a UH1B. When the UH1D came into the country, I was the crew chief on that one until I left. After Nam, went to Germany as a VIP crew Chief.Than to flight school and bact to Nam with the 1st Cav. I have a few pictures from the time frame. I was in the 56th from spring 69 to 70 and remember Jay. I was in the engine shop. I particularly remember Mr. Compton W3 who flew the UH-1's. He was really particular about the performance of the engines and the RPM settings. He left about 3 months after I got there, but I'll never forget him. He convinced me I could do things I had no idea I could do. I'm really sorry I missed the reunion last fall. I'll try to keep up with when ever there is another one. Also If Dale Beck or Roger Lehr see's this let me know. Your are also people who I remember as very close friends. Hi, I with 56th at Long Thanh north and was the crew chief and door gunner on 68-16411, 1969-1970. Do you know what has happen to 411? 68-16411 seems to be the Huey we're working on at Pacific Aviation Museum Pearl Harbor. Mr. Burlingame, any further news concerning 411 a/o 07/15? How is the 56th Huey restoration coming along? BTW, met Pete Taylor again, at our Long Thanh North veterans' 2012 reunion in Tampa, Florida. Nice to see that he still stays connected to us 56th guys. Dave Heikkila. How's the 56th Huey restoration coming along? BTW, met Pete Taylor again, at our Long Thanh North veterans' 2012 reunion in Tampa, Florida. Nice to see that he still wants to connect with us 56th guys. SP5 Dave Heikkila. I was in the 56 from Nov. 66 to nov.67. Served with a great bunch of guys. Benny Baxter Billy Maddox to name a few. Hey anybody who served at that time please E mail me at petegibbons@ ymail.com Have alot of pics of the compound and aerial shots and perssonnel. I'm former SP4 Bill Quillen. Flew on 411 with Charlie Donaldson from June through October '71 after being reassigned from the 539th at Phu Loi. I have pics and home movies taken while flying that I could share. I'm on facebook. I went to the Aviation Museum of the Pacific today hoping to see #411, It was not in the museum or in storage but UH-1 #708 was on the display floor. Unfortunately it is in bad shape. I flew #389 & #411 from Nov 69 thru Oct 70. Chris, I just got back from the museum. 708 is 411. I have the Bell Helicopter build number/ serial number. They have paint the wrong number on the side/tail area. I was the crew chief/door gunner Dec 69 to Aug 1970. Chuck was my door gunner. 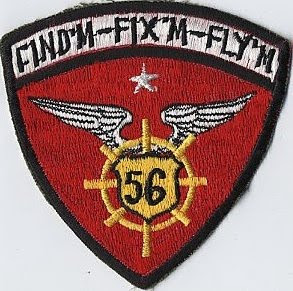 Hi, A little history about the 56th Transportation Unit. After finishing basic training I was sent to the 56 Transportation Unit. That was November 1963. Fort Lewis Washington. Unit was just forming. There were about 5 people in Unit. Across the road from the Unit was the little air field being built. Spring of 1964 the new hanger opened. During the Spring of 1964 Unit grew to about 100 men. October of 1964 Unit transferred to Viet Nam. Entire unit send to Bien Hoa. Unit was split in three parts. One part stayed in Bien Hoa. One part sent to Vang tau, (excuse spelling) south of Saigon. Our group sent to Tan Son Nhut. We left Fort Lewis in October 1964 next "door base". Mc Chord AFB. We flew to Travis AFB north east of Oakland, CA. Then flew to Saigon, but aircraft experienced engine trouble. So we landed in Okinawa, Japan. Kadena AFB for two days until a back up plane arrived from Travis, AFB. November 1, 1964 Bien Hoa received mortar attack. Seven men killed. We has left one week earlier. 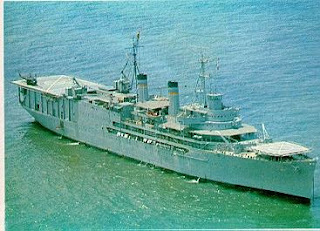 I left Saigon 10 August 1965 to Oakland Army Terminal for military discharge. If you have any questions I may or may not be able to answer. Send e-mail to me. 1goosegreen@msn.com. Hey 1Goosegreen! I too shipped over with the 56th from Ft. Lewis in October of 1964! in three C-141 Starlifter USAF aircraft. One stop in Hawaii, then Bien Hoa is as I remember it. I served with the 56th at Tan Son Nhut from Oct. 1964 until April 1967. Have lots of photos and other info, patches, etc. Drop me a line! Gentlemen, My name is Walter L, Anderson Jr. I am a retired Army SFC. My father Sp4 Walter L. Anderson is no longer with us. We lost him in 2010. My father left me with some items that I truly would like to share, to this unit's lineage. I have 60+ Kodak slides of various helicopter nose art, back drops, and of him in the Nam. I also have a set of orders of him for earning a Bronze Star for a helicopter recovery mission in Cambodia. My father never talked much about his experience. But I know he was a proud soldier. His helmet had "ANDY" across the front. He came home in 1968. When I was about t get promoted to E-5 back in 1992, I asked him... Dad, why didn't you want to make E-5? (Take it for the humor that it is), He replied: "I didn't want them to promote my black A..., back into that jungle" Would love to share. SFC (Ret,) Walter L. Anderson Jr.